Pliotec® LEB20 by Omnova Solutions is an unique water-based acrylic resin for exterior masonry paints, topcoats for EIFS and house plinths. Exhibits superior resistance to exudation (surfactant leaching) and efflorescence owing to the LEB (Low Exudation Binder) technology, strong early rain resistance, mud cracking resistance and superior dirt pick-up resistance. It is APEO-free with no added formaldehyde. 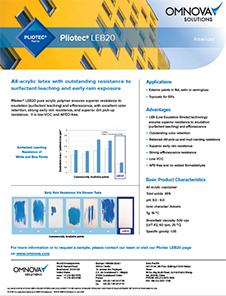 Pliotec® LEB20 shows outstanding color retention with good adhesion to porous masonry substrates. It has a shelf life of 12 months.